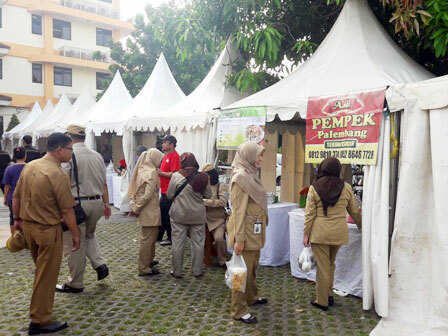 From Monday (5/14) to Tuesday (5/15), 64 new entrepreneurs participate to enliven OK OCE bazaar in Cilincing Sub-district held by North Jakarta KUKMP Sub-dept.
" Most of them run culinary and fashion businesses"
Cilincing Sub-district KUKMP Service Unit Head, Anggoro Budi mentioned, Cilincing residents who received OK OCE training take their part in this bazaar. "Most of them run culinary and fashion businesses," he informed, Monday (5/14). Cilincing Sub-district Head, Purnomo considered, this bazaar which involves OK OCE training participants will give a good impact for Cilincing residents economy. "They are not only get the skill, but also opportunity to open business. I hope this bazaar could be beneficial for the residents," he mentioned.